Why do you need Archives Filmworks? It’s not unusual to find moving images in the collections of cultural heritage institutions. Recent surveys show that 25% of archives, museums and libraries have at least some motion picture film in their holdings. Yet the presence of these unique items can be bewildering. Being machine-dependent, they challenge the staff in many ways. How do we know what we have? How do we assure that these items become useful resources? How do we catalog them? How do we provide access to their content? How can we take advantage of the interest our media-driven public has in them? How can we use them as a revenue stream? And how do we preserve them for the future? Archives Filmworks can help you with these challenges. 16mm film was the predominantly used moving image format during the 20th century. 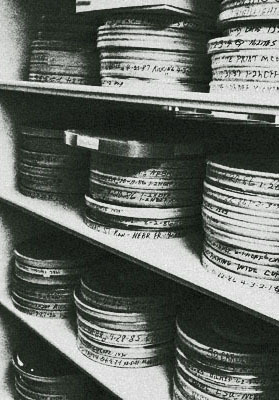 Promotional and sponsored films, educational films and documentaries, amateur-made films and home movies, television news footage and features, and many other genres were created on 16mm film stock. And these are the kinds of vintage films likely to be found in your archives, museum or library. That’s why Archives Filmworks concentrates on this preeminent film format. To compare the size of 16mm film against other common film formats, go to the 16mm Format History handout. What services does Archives Filmworks provide? Work with original vintage motion picture film requires knowledge, skill sets and equipment to which most archives, libraries and museums don’t have access. Archives Filmworks fills this gap. We inspect each film in detail, repair and clean it, rehouse it using archival-grade supplies, create a curatorial report that features the description, characteristics and condition of the film, digitize it and create surrogate reference copies on archival-grade optical media. In short, Archives Filmworks readies your films for long-term storage while leaving behind access to their content through digital reference copies and descriptive data. Archives Filmworks does what your film archivist would do, if you had a film archivist. For more detail on each step used in this process, and other services Archives Filmworks can provide, go to the Services page. Archives Filmworks grew out of a realization of both the ubiquity of 16mm moving images in archives, museums and libraries, and the absence of affordable vendors that can provide precisely what these institutions need. We don’t pursue work common to most film transfer houses, nor do we offer high-end lab services such as film-to-film or high-definition transfer. We embrace fundamental and practical approaches to both preservation and access. Paul Eisloeffel, the founder and proprietor of Archives Filmworks, has over thirty years of experience as an archivist in both historical society and museum settings. While he has worked with a broad spectrum of archival materials and artifacts, he has developed a particular expertise in moving images, especially on 16mm film. He is an instructor, presenter and published author on topics relating to moving images and is dedicated to education about and the preservation of these unique documents.